WHEREAS a Resolution in the following terms was passed by Dáil Éireann on the 11th day of September, 1997 and by Seanad Éireann on the 18th day of September, 1997. “Bearing in mind serious public concern arising from the Report of the Tribunal of Inquiry (Dunnes Payments) published on 25 August, 1997, which established that irregular payments were made to and benefits conferred on certain persons who were members of the Houses of the Oireachtas between 1 January, 1986, and 31 December, 1996. And noting further that the Dunnes Payments Tribunal was unable by reason of its terms of reference to investigate the source of the Ansbacher accounts, other than in respect of sums paid by certain persons referred to in the said terms of reference. Whether any substantial payments were made, directly or indirectly, to Mr Charles Haughey (whether or not used to discharge monies or debts due by Mr Charles Haughey or due by any company with which he was associated or due by any connected person to Mr Charles Haughey within the meaning of the Ethics in Public Office Act, 1995 or discharged at his direction) during any period when he held public office commencing on 1st January, 1979 and thereafter up to the 31st December, 1996 in circumstances giving rise to a reasonable inference that the motive for making the payment was connected with any public office held by him or had the potential to influence the discharge of such office. The source of any money held in the Ansbacher accounts for the benefit or in the name of Mr Charles Haughey or any other person who holds or has held Ministerial office, or in any other bank accounts discovered by the Tribunal to be for the benefit or in the name of Mr Haughey or for the benefit or in the name of a connected person within the meaning of the Ethics in Public Office Act, 1995, or for the benefit or in the name of any company owned or controlled by Mr Haughey. Whether any payment was made from money held in any of the accounts referred to at (b) to any person who holds or has held public office. Whether Mr Charles Haughey did any act or made any decision in the course of his Ministerial offices, to confer any benefit on any person making a payment referred to in paragraph (a) or any person who was the source of money referred to in paragraph (b), or any other person in return for such payments being made or procured or directed any other person to do such an act or make such a decision. Whether any substantial payments were made directly or indirectly to Mr Michael Lowry (whether or not used to discharge monies or debts due by Mr Michael Lowry or due by any company with which he was associated or due by any connected person to Mr Michael Lowry within the meaning of the Ethics in Public Office Act, 1995 or discharged at his direction), during any period when he held public office in circumstances giving rise to a reasonable inference that the motive for making the payment was connected with any public office held by him or had the potential to influence the discharge of such office. The source of any money held in the Bank of Ireland, Thurles branch, Thurles, Co. Tipperary, the Allied Irish Bank in the Channel Islands, the Allied Irish Banks, Dame Street, Dublin, the Bank of Ireland (I.O.M.) Limited in the Isle of Man, the Irish Permanent Building Society, Patrick Street branch, Cork or Rea Brothers (Isle of Man) Limited, in accounts for the benefit or in the name of Mr Lowry or any other person who holds or has held Ministerial office or in any other bank accounts discovered by the Tribunal to be for the benefit or in the name of Mr Lowry or for the benefit or in the name of a connected person within the meaning of the Ethics in Public Office Act, 1995, or for the benefit or in the name of any company owned or controlled by Mr Lowry. Whether Mr Lowry did any act or made any decision in the course of any Ministerial office held by him to confer any benefit on any person making a payment referred to in paragraph (e) or any person who was the source of any money referred to in paragraph (f) or on any other person in return for such payments being made or procured or directed any other person to do such act or make such decision. Whether any payment was made from money held in any of the bank accounts referred to at (f) to any person who holds or has held public office. Whether any holder of public office for whose benefit money was held in any of the accounts referred to at (b) or (f) did any act, in the course of his or her public office, to confer any benefit on any person who was the source of that money, or directed any person to do such an act. Whether the Revenue Commissioners availed fully, properly and in a timely manner in exercising the powers available to them in collecting or seeking to collect the taxation due by Mr Michael Lowry and Mr Charles Haughey of the funds paid to Michael Lowry and/or Garuda Limited trading as Streamline Enterprises identified in Chapter 5 of the Dunnes Payments Tribunal Report and any other relevant payments or gifts identified at paragraph (e) above and the gifts received by Mr Charles Haughey identified in Chapter 7 of the Dunnes Payments Tribunal Report and any other relevant payments or gifts identified at paragraph (a) above. for the reform of the disclosure, compliance, investigation and enforcement provisions of company law (including in particular those which relate to directors’ duties). for the protection of the State’s tax base from fraud or evasion in the establishment and maintenance of offshore accounts, and to recommend whether any changes in the tax law should be made to achieve this end. “Payment” includes money and any benefit in kind and the payment to any person includes a payment to a connected person within the meaning of the Ethics in Public Office Act, 1995. “Person” includes any natural or legal person or any body of persons whether incorporated or not. all costs incurred by reason of the failure of individuals to co-operate fully and expeditiously with the Inquiry should, so far as is consistent with the interests of justice, be borne by those individuals. This Order may be cited as the Tribunals of Inquiry (Evidence) Acts, 1921 and 1979 (No. 2) Order, 1997. A Tribunal is hereby appointed to enquire urgently into and report and make such findings and recommendations as it sees fit to the Clerk of the Dáil on the definite matters of urgent public importance set out at paragraphs (a) to (b) of the Resolutions passed by Dáil Éireann on the 11th day of September, 1997, and by Seanad Éireann on the 18th day of September, 1997. 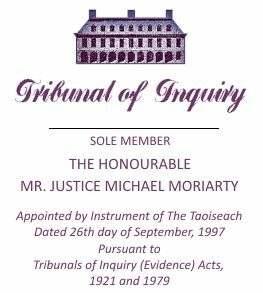 The Honourable Mr Justice Michael Moriarty, a Judge of the High Court, is hereby nominated to be the Sole Member of the Tribunal. The Tribunals of Inquiry (Evidence) Act, 1921 (as adapted by or under subsequent enactments) and the Tribunals of Inquiry (Evidence) (Amendment) Act, 1979, shall apply to the Tribunal.